Making Improper pruning cuts can leave your tree open to insects and disease here are 2 examples of trees healing from pruning cuts, good and bad. Above is a pruning cut made too close and cut into the brach collar. The area where the circle of new wood is incomplete will never properly heal leaving the tree open to pathogens and further decay. Washingtonia filifera or as it's commonly known, the California Fan Palm is the only palm tree native to California. The state of California grows hundreds of varieties of palm trees that can be found up and down the state but the only native is Washingtonia filifera. 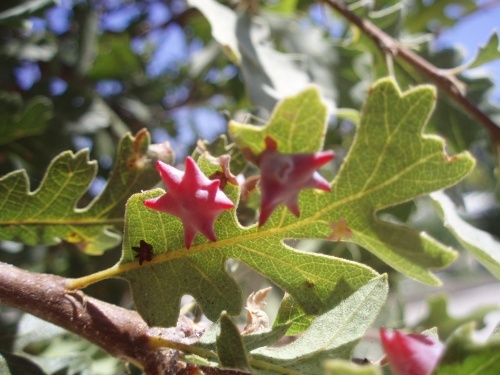 This is a photo of a gall caused by the tiny non-threatening Urchin Gall Wasp on a Valley Oak. These tiny wasp lay their eggs in the tissue of the oak leaves which develop these ornate homes in which their young to develop. October, The Perfect Time To Plant! October is a great time to plant! Planting in the fall allows the plant to develop large healthy roots prior to spring which gives them a head start from those planted in the spring. Plant in October and get ready for bigger blooms and healthier more established plants in the spring. Plant this time of year will also save water. Not to mention gardening in the fall is much cooler! Apply mulch to the soil surface around trees in the garden helps reduce water loss do to evaporation and creates favorable conditions for root growth. Trees like it and it can lower you water costs. Using mulch also reduces the chance of damage to trees trunk caused by mowers and string trimers and increases soil nutrients. The ideal mulching would be 3-4 inches deep and spread from the trunk to the edge of the drip line but the spread will depend on the space available in your garden landscape. Don't Put Away Those Gardening Tools Just Yet! Fall is in the air but don't put away your spades and gardening gloves just yet. Fall is a great time to plant, prune and prepare for spring flowers. It is important to select the right tool for the pruning job at hand. Selecting the right size tool for the cuts being made will reduce the damage to tissue beyond the scope of the work reducing insect and pathogen damage. Every gardener should have a few essential pruning tools on hand that will cover the majority of the pruning cuts made seasonally. The first and most important is a pair of good Bypass Pruners used for removing small pencil size twigs up 1"-1.5" limbs depending on the size of blade. When Should You Prune Trees and Shrubs? The removal of dying, diseased, broken, rubbing or dead limbs can be done at anytime with little negative effect on the plant. 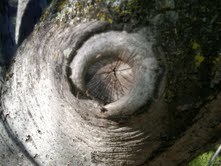 For deciduous trees pruning during the dormant months can make spotting and removing defects easier. Pruning all trees during the winter months also reduces the risk of pest problems associated with wounds caused by removing limbs. Pruning should not take place during or just after the seasons flush of new growth, this can lead to stress and slowed growth. Pruning too early may also prevent flowering on trees and shrubs that flower on new wood. We often get questions regarding how much should I, or can I prune out of my trees and shrubs? Think of plants needs like our human needs. We all need a good place to live i.e. a roof over our head with things around us that make us feel comfortable. Plants are the same you just need to know a little about the species to know their needs, is it full-sun or full-shade (The roof). Good soil conditions with the right amount of sand, clay, loam and just right amount of organic matter(Comfort). Both plants and humans need food, some are big eaters and some are nibblers, its just a matter of knowing the crowd you're serving (Fertilizer).